VANCOUVER, BC / ACCESSWIRE / October 16, 2018 / Casa Minerals Inc. (the "Company") is pleased to announce the discovery of a network of polymetallic mineralized veins in the Golden Dragon prospect, which is part of its 100% owned Pitman property located 20 kilometers north of Terrace, British Columbia and 15 km northwest of the Company's Keaper property. The Golden Dragon prospect includes the historic Paddy-Mac gold veins. The Golden Dragon veining network was discovered by Casa's field crew that was prospecting and sampling in the area of the historic Paddy Mac and Gold Dome gold prospects. The system includes multi-level semi-parallel veins of apparent east-west attitude that have been traced intermittently over an approximate distance of 500 metres. Numerous occurrences are daylighted on the north facing slopes of the Nass Plateau and are overlaid to the west by talus material. Veins are inclined southerly at 55 to 65 degrees and are hosted by brecciated argillite cemented by stringers of quartz and irregularly distributed pods and veinlets of pyrite and chalcopyrite. Widths vary and in places are as much as three metres (10 feet). The new veins were discovered by Casa’s exploration team in August 2018 and have not been fully mapped and sampled. Casa's geological team is continuing to map and sample various parts of the Golden Dragon discovery area. One area, the "Lucky Zone", located on higher elevations of the Golden Dragon is inaccessible but is estimated to be 2 to 5 meters wide and about 35 metres in exposed length: abundant malachite (copper) staining may be evidence of strong copper/gold mineralization. Casa Minerals' field crew is continuing geologic mapping, prospecting and soil sampling work in order to better understand the geology and mineralization of all parts of the Pitman property. The Company plans to complete an airborne geophysical survey of both its Pitman and Keaper properties. Further results of work will be announced when received. The Pitman Property comprises five contiguous mineral tenures covering 4255.6 hectares and is located 20 kilometers north of Terrace, British Columbia. 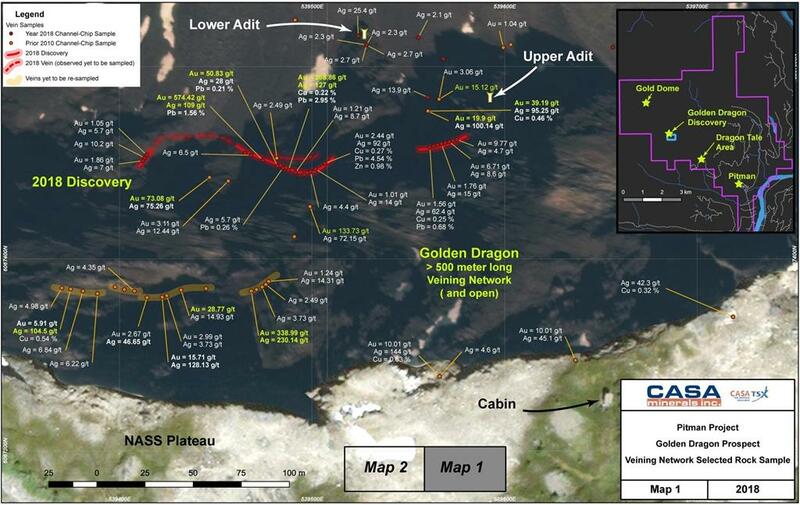 The mineral claims of the Pitman Property include several historic prospects, including the Pitman copper-molybdenum ± silver prospect, and the Gold Dome and Paddy Mac gold-base metal prospects and the newly discovered Golden Dragon. Casa's field crews have been exploring the Pitman Property at intervals since 2005 and since June of this year have concentrated on prospecting and soil sampling in order to better define the distribution of gold, copper, silver and molybdenum values. Some parts of the property have only recently become accessible as a result of the retreat of glaciers and permanent snowfields. Further work is planned, including an airborne geophysical survey and programs of diamond drilling. Casa's Arsenault VMS Property comprises eight mineral tenures covering approximately 9,672.5 hectares located in the Atlin Mining Division, British Columbia. The Company in recent years has conducted several exploration programs on the Arsenault Property and believes that an attractive volcanogenic massive sulphide exploration target may be located within its limits. Further work is planned, with the objective of proceeding to a drilling program to test several areas identified by geological mapping, prospecting, and geophysical and geochemical surveys. Information set forth in this news release contains forward-looking statements that are based on assumptions as of the date of this news release. These statements reflect management's current estimates, beliefs, intentions and expectations. They are not guarantees of future performance. The Company cautions that all forward looking statements are inherently uncertain and that actual performance may be affected by a number of material factors, many of which are beyond the Company’s control. Such factors include, among other things: risks and uncertainties relating to the Company’s limited operating history and the need to comply with environmental and governmental regulations. Accordingly, actual and future events, conditions and results may differ materially from the estimates, beliefs, intentions and expectations expressed or implied in the forward-looking information. Except as required under applicable securities legislation, the Company undertakes no obligation to publicly update or revise forward-looking information.